Designed by an alumni residency trained OD from PCO, this education year is for the resident to be treated as an individual. We invest the time to understand, remember and meet all their needs, wants and personal expectations. Ultimately, our goal is to give our resident the skills to compete for any OD health care job in the marketplace upon graduation. Each of our team of physicians shows attentive and engaging care in all sub specialties. We are supportive educators and trusted advisors who will strive to identify barriers the resident faces and eliminate them to ensure our resident’s success. 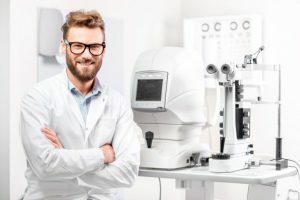 Newsom Eye’s goal is to provide a unique post-doctoral experience in a multidisciplinary setting with the intent of graduating a self-supportive, knowledgeable eye care physician capable of engaging in eye care in any setting. Multidisciplinary care is provided with a LASIK/Refractive cataract surgery specialist, glaucoma specialist, oculoplastic specialist, two retinal specialists and a cornea specialist. The center has associated AAAHC certified surgery centers on site with excimer (Contoura tomography guided), femtosecond, and Ellex YAG technologies to cross train and expand the understanding of the resident for co-management of all surgical care. FDA and CXL studies are currently underway at Newsom Eye and the resident will also have significant exposure to new technologies in eye care and actively participate in them. Anterior segment disease and specialty contact lenses will be another aspect of the residency program. Specialty lens fittings for regular and irregular corneas includes, but is not limited to: hybrid lenses, scleral lenses, rigid gas permeable lenses, soft specialty designs for diseased corneas, and all soft modalities. Multiple lens companies will be utilized for specialty fittings, as well as a wide variety of diagnostic fitting sets that will be available for the resident’s use in office. We also make it a goal of ours to provide an insightful business experience in the realm of eye care and eye care business from both an OD and OD/MD concept. This includes training in coding, billing, insurances, marketing and many other important facets of eye care business. 1. Deliver clinical services at a level that demonstrates they have attained the core competencies of the program. This is evaluated and trained if needed early in the program to ensure continuity of care. 2. Successfully complete all clinical rotations. 3. Complete one to two papers suitable for publication in a refereed optometric journal. 4. Participate in required seminars, grand rounds, case conferences, and continuing education. 5. Maintain a log of patient names and associated information. 6. Complete all required evaluations of the program. $40,000 plus $3,000 for continuing education (Academy, PCO visit minimum).